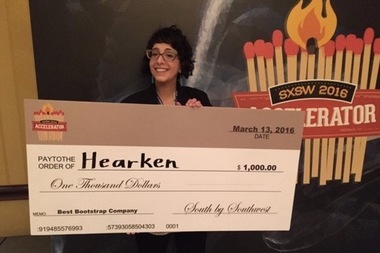 Hearken co-founder Jennifer Brandel receives a check for $1,000 at SXSW after Hearken was named the Best Bootstrap Company. UPTOWN — Hearken, an Uptown-based journalism tech startup created by the founder of WBEZ Chicago's Curious City, was named the Best Bootstrap Company at this year's SXSW Accelerator Competition. The award, which comes with a $1,000 prize, is presented to an "up-and-coming team that demonstrates the greatest creativity and potential across all categories in the competition without" receiving significant funding, according to a news release from Hearken, located near Carmen Avenue and Sheridan Road. Jennifer Brandel, who left WBEZ's Curious City last year, participated in the festival's pitch competition and accepted the award on behalf of the team. After leaving WBEZ, Brandel joined Corey Haines "to build Web tools that help journalists engage their community by harnessing curious audience questions to influence the news cycle," the release said. Last summer, Brandel and Haines joined a 20-week tech accelerator program in San Francisco developing the tools to establish Hearken's editorial model. After completing the program, the duo "raised over $700,000 in small-scale investments" allowing the company to expand to seven employees and landing its tools in 45 newsrooms. Hearken "enables media outlets to engage audiences in reporting from story genesis to completion" by allowing readers to pitch stories in the form of questions and vote on their favorite ideas. It bills the concept as public-powered journalism, instead of crowdsourcing, because the audience engages other readers because of the subject's relevance to them, according to its website.